Technically it is autumn…just. Even though the days are still occasionally hot the evenings are cool. It’s time to get the slow cooker out for a comforting stew. As it is St Patrick’s Day I am reflecting on my Irish heritage. I have prepared some traditional Irish fare to share with my family. We are Australian now but when my ancestors arrived they were Irish. On the Bendigo goldfields where they settled, they cooked a Colonial version of their hearty stew using whatever ingredients were available. Today is a total fire ban day so I won’t be cooking on an open fire. It’s hard to be authentic so I will just share my version of the Colonial Irish Stew. For the New Chums in the early days of the gold rush there was only mutton, potatoes and damper. When the deep shaft sinking commenced and people established themselves in the community, more vegetables and herbs were grown in the gardens of the mining families. Onions, carrots and parsley were thrown into the pot. My family had a close association with the Chinese market gardeners. The Ah Loong’s and the Lougoon’s of Myers Flat grew tomatoes and cauliflowers for them to share. 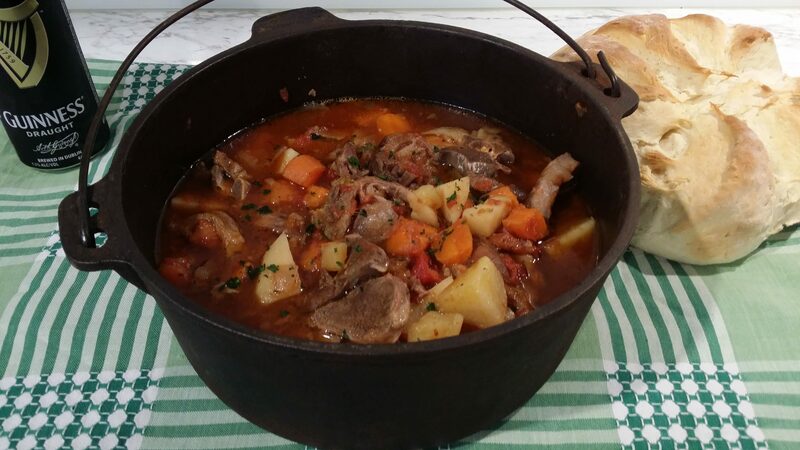 My ingredients for my Colonial Irish Stew is – lamb, potatoes, onions, carrots, tomatoes, parsley. In a large frying pan, heat the lard, and then brown the chops. Turn on the slow cooker and place the browned chops inside. Add the onion, carrots, potatoes and tomatoes. Cook for 6 hours on high. 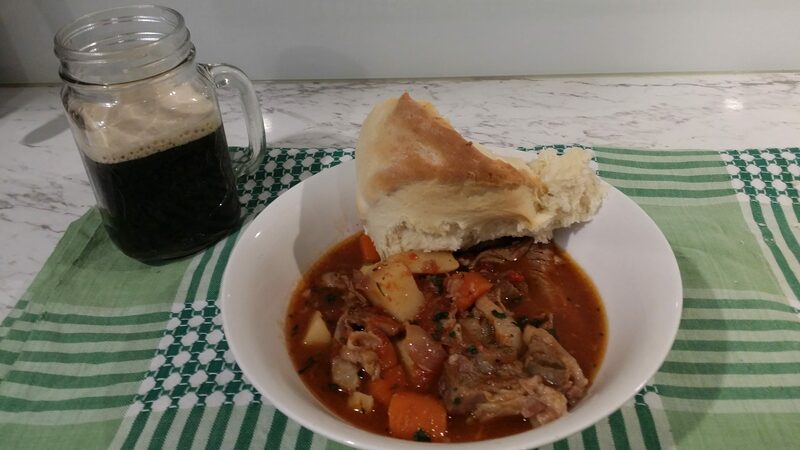 Serve with chopped parsley, damper and a pint of Guinness. My Irish ancestors left just before the official start of the Irish Potato Famine. It had been a bad couple of seasons for potatoes and milk, the staples of the Irish diet. The winter of 1838 was so bitterly cold that the cottages were snowed in and the cows froze to death. The potato crops partly failed three times in the 1840-41 growing season which put pressure on the tenants and land owners alike. Tenants ate their crops instead of selling their usual surplus and employers cut staff to shoulder the loss. Alice was a farm servant, her daughter Mary (Anastasia’s mother) was a house servant and Martin was a carpenter. The Keane family livelihood was jeopardised. 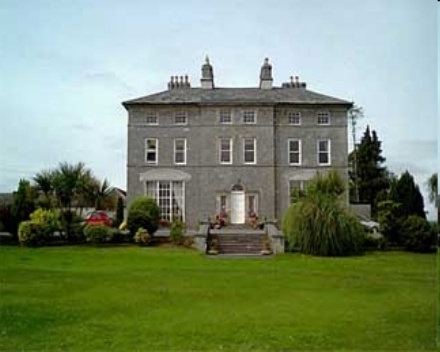 They worked for the Ryan family at Inch House, County Tipperary. Martin Keane and Alice Ryan left for Australia with their six children in 1841. Inch House is now a country house and restaurant. I would love to visit and eat there one day. Soon after arriving at Sydney, Mary Keane was married to Michael Maher, a young Irishman who travelled on the same ship Larne. Michael had a terrible temper when he drank and was known to fight anyone who crossed his path, including members of his wife’s family. By midnight at a family wedding on 14 November 1843, he was all fired up and started challenging the groom’s relatives to a round with him, ‘As he was as good as any Connaught man among them.’ No-one accepted his offer so he left the house. His father-in-law Martin Keane followed him outside and into Sussex Street to say goodnight but Michael picked up a brick and threw it at him. The brick hit Martin in the forehead opening up a very deep wound, 5 1/2 inches long between his eyes. Martin lost a lot of blood and was taken to the hospital where he stayed for twelve days under the care of Dr. Tierney. For this assault Michael was sentenced to six months imprisonment at the Darlinghurst gaol. The prosecuting Chairman said that the injuries caused by the assault had endangered life and had Martin died he would have charged him with murder. 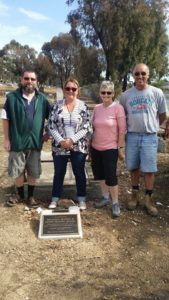 When gold was discovered at the Ravenswood Run sheep station in September 1851 by Margaret Kennedy and Julia Farrell, Anastasia’s parents Michael and Mary were living in Sydney, with their two infant daughters Alice and Catherine. The papers were a buzz with news of a gold discovery in Victoria and the new gold rush at Bendigo where nuggets the size of apples could be plucked from the ground. Michael considered himself as worthy as any other man to seek his fortune in gold and dreamt of escaping to Victoria. His dream became a reality in the summer of 1852-53. He made love to his wife one last time, said goodbye to his daughters and boarded a ship to Melbourne. On the goldfield he claimed a spot at Derwent Gully, pitched his tent and here he stayed and worked as a gold miner throughout his life. Mary and their children joined him and they went on to have three more children. Money was raised by the members of the Descendants of Anastasia Maher Facebook page to have a memorial plaque placed at the gravesite of Michael & Mary Maher. It was officially placed on Easter Monday 17 April 2017. A small group of descendants attended the plaque on that day. Those present were Thomas Maher, Sue Thomas and her husband, Denise Henderson, Brian Lougoon and Lyndal Simmonds. “Police Court Business”, The Sydney Morning Herald (NSW: 1842 – 1954), Nov 28 1843, page 2. “Quarter Sessions”, The Sydney Morning Herald (NSW: 1842 – 1954), 12 Feb 1842, page 2. Another great tidbit from the Keane/ maher mob from Ireland. Love your stories. They are so well written. I’m sure that Michael Maher was a bit of a lout and I don’t really like him much in the family story. I do, however, have a more amicable feeling about Martin and Ally Keane. Thanks Denise. I do think Martin and Ally may have been more educated. Ally got into a bit of trouble though against her Protestant neighbour. Copyright © 2016 Thornetree Genealogy. All rights reserved.